The biologists at Inwater Research Group (IRG) are skilled at safely capturing and assessing sea turtles, as part of marine research projects throughout the southeastern United States. However, the in-water capture of a leatherback is challenge even for the professionals. Leatherback sea turtles, once commonly called “trunkbacks,” are the largest reptile in the world. Growing to over 6 feet long and weighing up to 2,000 pounds these animals are truly living dinosaurs. gives biologists a unique opportunity to capture between 300 and 900 sea turtles each year. The nuclear reactors are cooled using ocean water pulled through large diameter pipes into an intake canal that transports the water to the power plant. Sea turtles find the offshore structures housing the intake pipes attractive because they resemble reef ledges that provide refuge. As a sea turtle swims into these structures they are quickly transported ¼ mile through one of the intake pipes into the intake canal. Once in the canal, sea turtles can’t swim back to the ocean due to the velocity of water coming through the intake pipes. After sea turtles enter the intake canal, a barrier net prevents them from reaching the plant while still allowing water to flow freely. 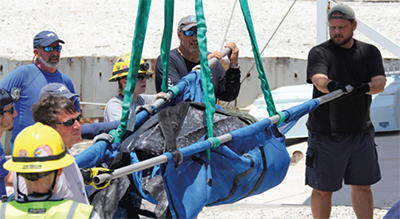 IRG biologists are then responsible for capturing, assessing, and releasing the sea turtles back into the ocean. was lifted out of the canal and transported to the beach. At the beach the biologists worked quickly to take a series of standard measurements and photographs. This leatherback was relatively small, measuring only 54 inches in shell length and weighing an estimated 500 pounds. The biologists noticed two small tag scars on her rear flippers, meaning another group of researchers had likely encountered her before. The turtle was then scanned for a PIT (Passive Integrated Transponder) tag, which is similar to the microchip that is put into your pet. A PIT tag was discovered, and the turtle’s unique identification number was recorded. The turtle’s identification number was passed along to the Archie Carr Center for Sea Turtle Research at the University of Florida. The Center maintains a database with sea turtle tag information for most of the world’s sea turtle research programs. 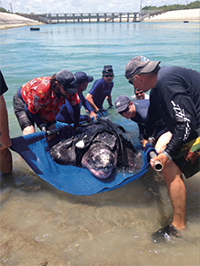 The leatherback captured at the intake canal was originally tagged in 2001 in Melbourne Beach, Florida by the University of Central Florida’s Marine Turtle Research Group. She has also been seen nesting multiple years in Juno Beach, Florida in the time between her initial tagging and capture at the canal. To learn more about the St. Lucie power plant turtle monitoring program or more about Inwater Research Group and their other projects please, visit www.inwater.org.